4. To make the butter icing, use an electronic mixer and beat the butter for 2 minutes. 5. Gradually add the icing sugar and once all of it has been incorporated, beat on maximum speed until the mixture is light and fluffy. This will take around 5 minutes. 6. Place a star shaped nozzle onto a piping bag and, using a spatula, transfer the buttercream inside the piping bag. The buttercream is now ready for piping. 7. Follow the instructions on the popcorn packet to pop the corn. Once cooled, pipe your icing onto the cupcakes. 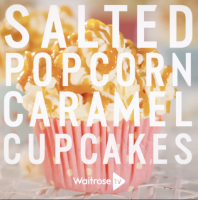 Carefully roll each iced cupcake in the popcorn until fully covered. Finish with a drizzle of caramel sauce.